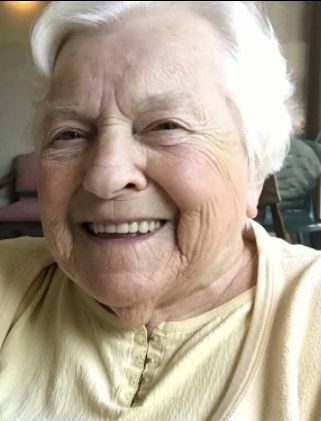 North Greenbush - Marion Reckner Richardson, 95, formerly of Mountainview Avenue Troy died Tuesday, September 4, 2018, at Van Rensselaer Manor after a long illness. Born in Troy, she was daughter of the late Leslie G. Reckner and Florence E. Wells Reckner and wife of the late H. James Richardson. She had resided in Troy all her life and was a 1942 graduate of Troy High School. Mrs. Richardson was employed as a secretary for Ryan and O'Hare Insurance in Troy for 32 years, retiring 23 years ago. Survivors include three daughters, Barbara (Thomas) Ricciuti, Cropseyville, Lorraine Law, Wynantskill and Lois J. Richardson, Troy; a son, Paul R. Richardson, Troy; a sister-in-law, Betty Berner, West Sand Lake; her grandchildren, Bryan and Becky Ricciuti, Wally and Laurie Law, Roger and Scott Law, Daniel and Shelbi Richardson; 5 great grandchildren and several nieces and nephews. She was predeceased by her siblings, George Reckner and Ruth Duffney and a son-in-law, Wallace Law. Relatives and friends may call at the Bryce Funeral Home, Inc. 276 Pawling Avenue Troy on Thursday, September 6, 2018 from 4-7PM. Funeral service will be held Friday at 10AM at the funeral home with Rev. Trygve Tomlinson, officiating. Interment will be in Eagle Mills Cemetery Eagle Mills. In lieu of flowers contributions may be made in memory of Marion Richardson to the Mountain View Fire Company 2 Shafter Avenue Troy, NY 12180.